The Faculty of Information and Communication Technology supports students who need financial aids and perform well academically. The faculty recognizes the importance of educational financing and hopes that the options provided by the faculty and university will be useful in planning and managing student’s educational expenses. Students and parents should visit the admission page to learn more about the tuition and university fees of each program offered by the Faculty of ICT. Financial aids are also made available from third parties such as Thai and foreign government agencies and private companies. Students who need financial aids must notify the Faculty of ICT at the time of applying to the Faculty of ICT. ICT Undergraduate 4-Year Full Scholarship is awarded to an applicant who demonstrates exceptional academic and/or activity qualifications when applying for the Bachelor of Science in ICT program of the Faculty of ICT or has been selected under the discretion of the admission committee of the Faculty of ICT. This scholarship covers all tuition fees of the Faculty of ICT for the entire program. However, the university fees are excluded. 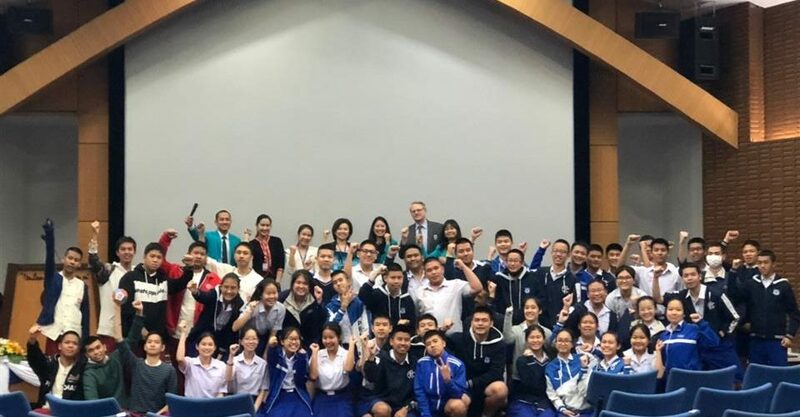 In addition, only for the first enrollment, scholarship students must pay 10,000 baht for specific fields of information technology and communications by themselve. The awarded recipient must maintain his or her average GPA above 3.0 for each academic year. ICT Undergraduate 4-Year Partial Scholarship is awarded to an applicant who demonstrates excellent academic qualifications when applying for the Bachelor of Science in ICT program of the Faculty of ICT or has been selected under the discretion of the admission committee of the Faculty of ICT. This scholarship covers parts of tuition fees of the Faculty of ICT for the entire program. However, the university fees are excluded. The awarded recipient must maintain his or her average GPA above 3.0 for each academic year. ICT Undergraduate One-year Full Scholarship is awarded to a student who performs well during his or her study in the program. A student whose average GPA in the previous academic year is at least 3.80 or has been selected under the discretion of the admission committees will be awarded the scholarship. This scholarship covers tuition fees of the Faculty of ICT for one academic year. However, the university fees are excluded. ICT Undergraduate One-year Partial Scholarship is awarded to a student who performs well academically during his or her study in the program. A student whose average GPA in the previous academic year is between 3.60 and 3.80 or has been selected under the discretion of the admission committees will be awarded the scholarship. This scholarship covers parts of tuition fees of the Faculty of ICT for one academic year. However, the university fees are excluded. This scholarship is awarded to an applicantwho demonstrates excellent academic qualifications when applying for the Master of Science in Computer Science program of the Faculty of ICT or has been selected under the discretion of the admission committee of the Faculty of ICT. This scholarship awards a bachelor or master student who graduates with exceptional GPA from the Faculty of ICT. The goals of the scholarship are to give students excellent opportunity to pursue their career in academia with the Faculty of ICT, and to provide long-term quality human resource in academic for the Faculty of ICT. The scholarship allows the awarded recipient to study in the Master’s or Ph.D.’s program of any reputable university in the world with the support from the Faculty of ICT. After graduation, the awarded recipient is required to serve the Faculty of ICT as faculty members. ICT Ph.D. Scholarship’s goal is to encourage the development of computer scientists for Thailand. This scholarship is awarded to an applicant who demonstrates excellent academic qualifications when applying for the Doctor of Philosophy in Computer Science program of the Faculty of ICT or has been selected under the discretion of the admission committee of the Faculty of ICT. The scholarship covers tuition fees and monthly allowance for each recipient. Dongguk University, a partner university with Mahidol University, is now open for application for Dongguk University (DU) Student Exchange Programme for 2012 Fall semester (August 23 – December 21, 2012). Exchange students can take courses at DU and participate in the Internship, Language Tutoring and buddy programs to learn more about Korean culture while teaching English language. The application deadline is June 30, 2012. Please contact Dr. Boonsit Yimwadsana for more information. Hokkaido University, Mahidol University’s Partner, has not been affected by the Tsunami and the nuclear problem in the Tohoku district in Japan in March 2011. The university is still accepting new students and joint research.